Dental bridges are also called fixed bridges or fixed dental prostheses. They are one of the first non-surgical solutions to replace a missing tooth. Replacing missing teeth with a bridge makes it possible to avoid several problems in the future, such as the migration of adjacent teeth and the reduction of the masticatory coefficient. A fixed bridge is a fixed dental prosthesis that replaces one or more missing teeth by anchoring between adjacent teeth or implants. It consists of an artificial tooth fixed between two crowns. It is permanently attached and cannot be removed. Traditional dental bridges: These are used when the teeth on either side of the edentulous space are healthy. Your dentist may recommend a dental implant to avoid filing down and damaging healthy teeth. Dental bridges on implants: often the best solution when the teeth next to the edentulous space are not healthy or you have no teeth. As the name suggests, this type of dental bridge requires one or more implants to be placed surgically in the bone of your jaw. If you take care of it, a dental bridge should last about 10 years. Implants and bridges are often a better alternative to dentures. They’re often more secure, are always permanent, and are easier to maintain. 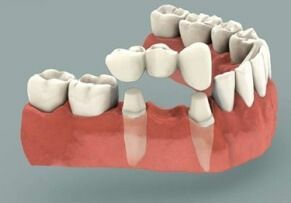 To ensure that your dental bridge lasts as long as possible, it is important to take care of it. Cleaning procedures for bridges are similar to those for your natural teeth. You must brush and floss in the center and under the bridge, as well as around the artificial teeth.